Last month I was invited to a great gig: Guest Bartender at the incredible Frank’s Bar at Maksoud Plaza SP! The event was sponsored by the lovely folks from Leblon and besides sharing the mahogany with Spencer’s team, Leblon’s brand ambassador Marco De La Roche was there too. If you don’t know Leblon, Marco or Spencer yet you should go check their works! Summer is right up the corner and the sun is blazing here in Brazil, so I decided to give a little summer spin on a old creation: the Cerrado Mineiro. Tamarind juice is a very interesting beverage, but if you are trying to make a lot of the stuff you may not be interested in breaking hundreds of pods, removing thousands of strings and soaking millions of this beautiful fruit in water to later remove all the seeds and then straining the liquid. My lazy hero Jeffrey Morgenthaler has already used it, so will I.
I went for the Exotic Food brand, from the options I had available this was the one with less sugar and sodium added. I decided to kick the acidity a bit with some lemon/lime juice and sweeten the mix with sugar+maple combo. Mix and reserve, dilute with club soda to taste. For the highball version of the cocktail I just removed the bitters and absinthe and added some club soda. Build in a highball glass, mix briefly. Great holidays to you all. 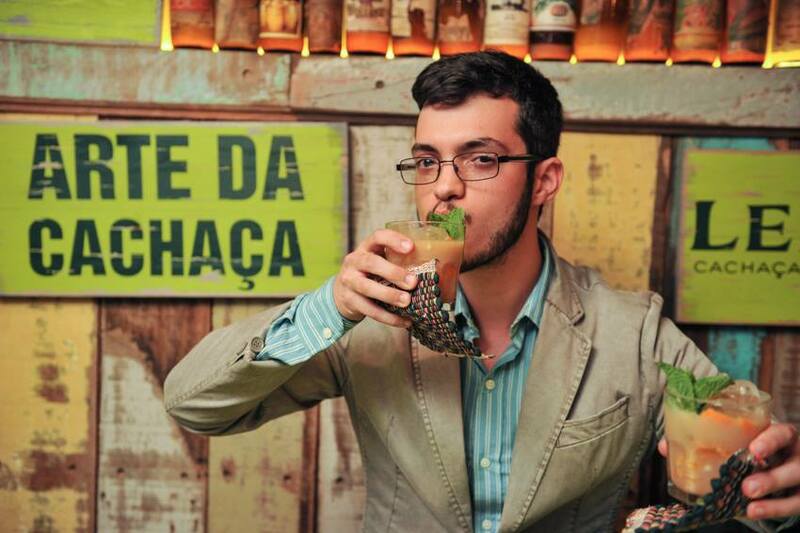 About a month ago I had the pleasure to join Arte da Cachaça a cocktail competition sponsored by Leblon. This competition was all about brazilian cocktail culture: its traditions, histories and techniques. The selection to the finals was theme on “The Country of Caipirinha”. Each bartender was to make a caipirinha-style cocktail inspired by the original history, traditions and techniques. 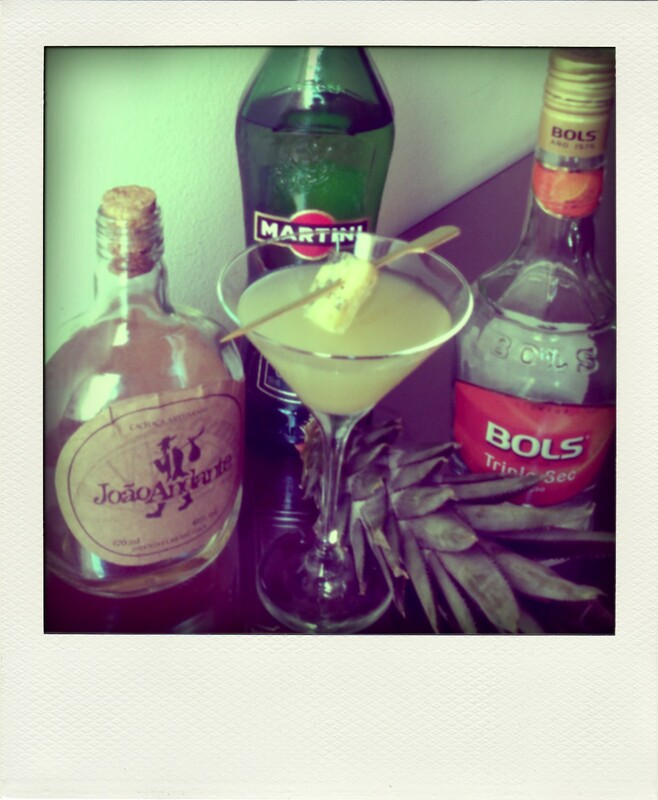 My main inspiration for this came from the Uai Tai, by Minas Gerais most famous cocktailian mind Tony Harion. Leblon has a aged expression called Leblon Reserve which ages in old Cognac casks hance retaining lots of simmilarities with this product, like its dried fruits characters. 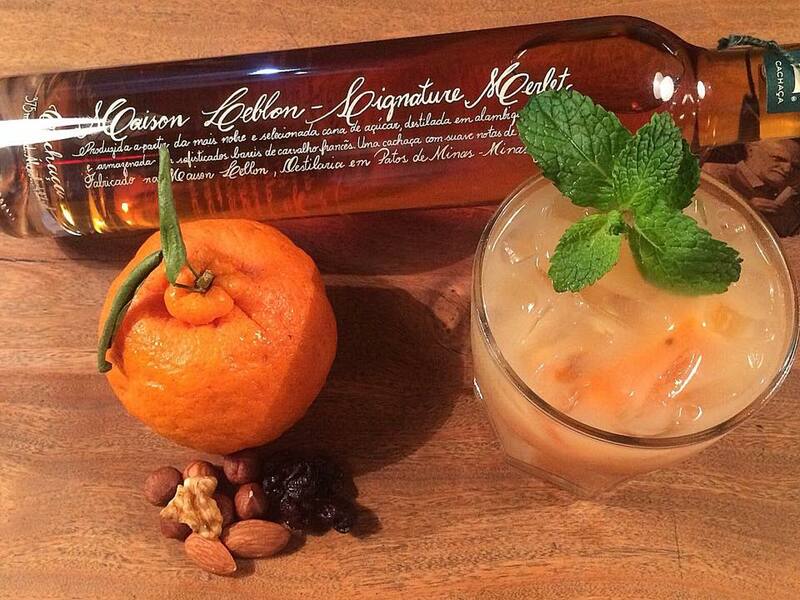 This Cognac qualities presented and the Rum-ish spirit that is cachaça works very well with orgeats. See for example the Mai Tai and the Japanese cocktail. We can identify a Caipirinha by some major factors: Muddled citrus fruit, quality Cachaça, built in the glass it will be served. 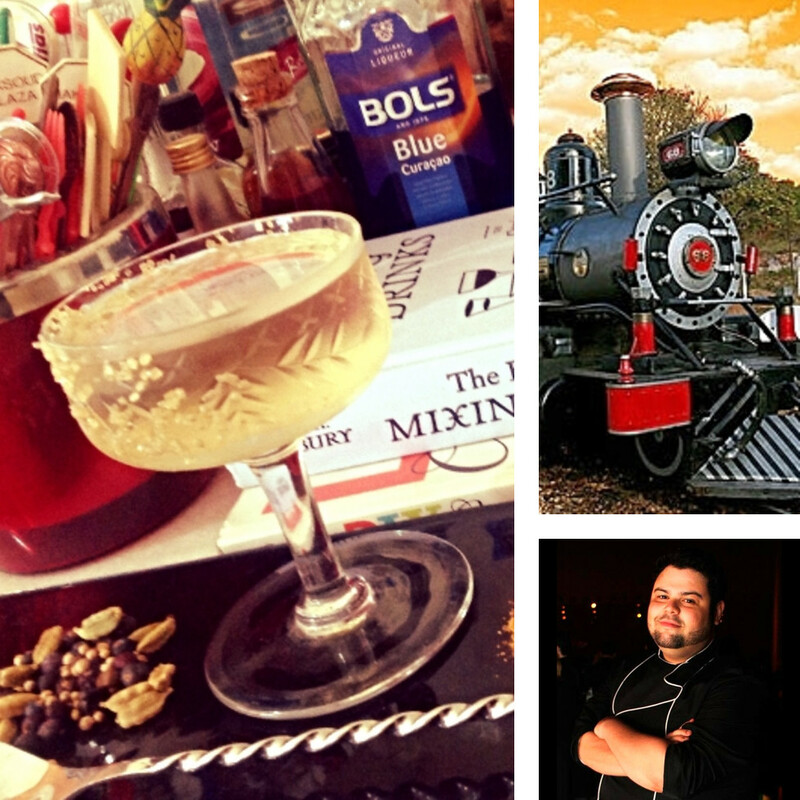 Another inspiration comes from the tradition to always eat something wile sipping, be it a feijoada or a nuts mix. Since almond notes will work well with our base spirit (Leblon Reserve) it was easy to use the nuts mix as a base for an orgeat. Those nuts mix usually has some raisins thrown in and those would compliment well the dried fruits characters in the Leblon Reserve. 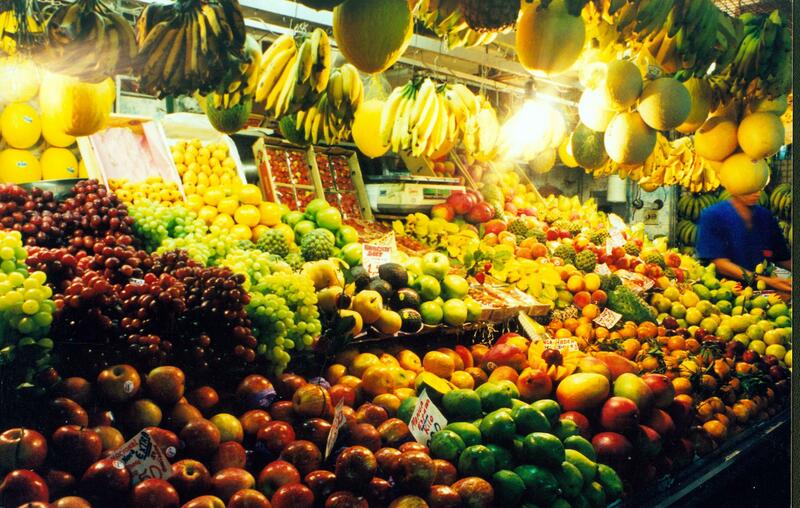 Here in Brazil it is very common to use other citrus fruits other than the typical tahitian limes, simply out of availability and necessity. Since September/October is mandarin season in here and those fruits have some bitter notes in its peel it would work well in place of the triple-sec used in the Uai Tai / Mai Tai. Hence I have my caipirinha-style Mai-Tai-inspired cocktail Trem bão, which translate to Good stuff, just like Mai Tai translate to Really good. Muddle the mandarin with the orgeat. Add the other ingredient, then add ice and stir briefly. Garnish with the mint sprig. The most iconic brazilian classic are: Caipirinha, Rabo de Galo and Bombeirinho. The Rabo de Galo being the aromatic one and the others fruity/sours. Since the brazilian palate is evolving to a more aromatic, dry, bitter styled cocktails it seems logical to make something along this way. the São Paulo way: Cachaça and Cynar. Having already utilized the aged expression it was time to make something with the “unaged” Leblon. Since cachaça is a fairly sweet spirit I blended it with dry vermouth and also added some complexity by utilizing Benedictine along with the Cynar. This real apotheosis to the Boteco (from greek apothéke) traditions was named then Apotekose. 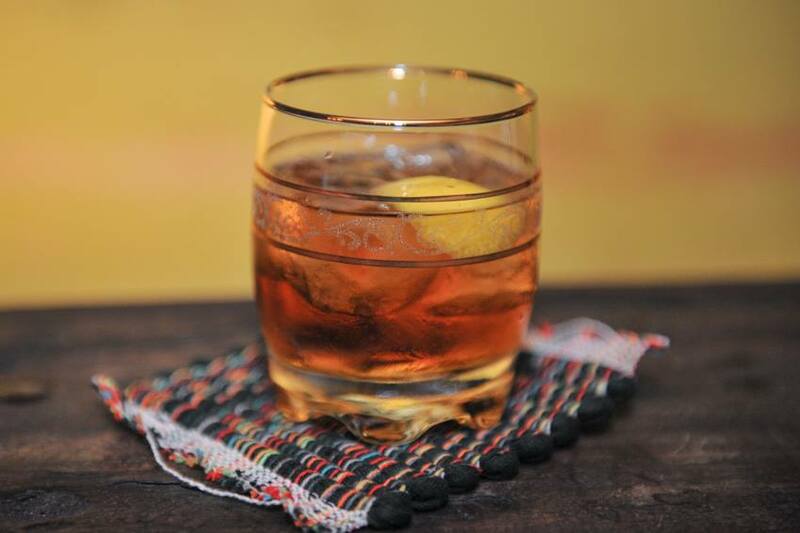 Mix the ingredients over ice, honoring the boteco traditions. Or alternatively stir and strain over a rock, craft cocktail bar style. P.S: The winner of the competition, my good fellow Caio Bonneau, will be as guest bartender in Employees Only some time next week. Make sure to go there if you are around NYC. Soak the nuts in water for 8h and drain. Blend the nuts, raising and water. Strain and add the sugar, mix to disolve. I’m very proud to say that I am one of this years finalists to the Brazilian Grey Goose VLR this year. The final will be in São Paulo city next month, so I’m pausing my Templates Project: Classics until mid-November. Now I would like to tell how I got a first position in Belo Horizonte semi-final and how a macaw-muddler is totally in accordance with the high-class Grey Goose brand. My first glimpse into this cocktail was from my first contact with Grey Goose L’Orange, it taste very much like an orange liqueur with a hint of almond very similar to some rums nuttiness. Those flavors sound very Daiquiriesque to me and the orange+almond combo is the signature twist in the Mai Tai. Going in the Mai Tai lines a Orgeat would be the common way to amplify the almond notes present in the base spirit, but following along with GG philosophy I sourced local peanuts and made my own Peanut Orgeat, which was inspired by brazilian desserts like paçoquinha . For those of you who don’t know Grey Goose is the first super-premium brand of vodka, back in the year of 1997. It is carefully produced to preserve the taste from the wheat, being the first vodka to sell flavor, not purity. – The high standards, quality and heritage used by their Maître de Chai François Thibault to produce the “best tasting vodka”. François Thibault is the face behind the brand, the dissident who decided to produce vodka in the Cognac region, being called a maverick by the Cognac producers. Another maverick that relates to the craft cocktail movement is Donn Beach, the tiki cocktail father. Donn revamped the post-prohibition & post-WWI cocktail scenario by bringing back fresh fruit juices, high quality destilates and fun back to the game. Shake & strain into crushed ice. Garnish with mint sprig and Grey Goose La Poire float. To make the peanut orgeat, mix 1 cup peanut milk* with 1 cup demerara sugar and 1 teaspoon Orange flower water. The orange flower water is what bring complexity to the cocktail, marring together the orange oils present in the vodka with the fat from the peanuts. 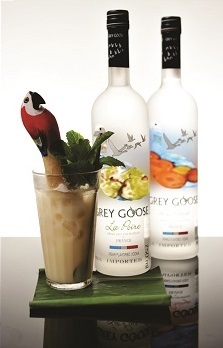 The La Poire float and the mint sprig bring fresh and fruity aromas that helps to smooth the cocktail. The macaw-muddler is my way to be bring a smile in the face of my guest while he/she enjoy a nice crafted cocktail with the best products available. *To make peanut milk, soak 1 cup unsalted peanuts in water for 2 days, strain and blend with 2 cups water. It’s that time of month again! It’s MxMo! Our host is Fred Yarm, also the man who keeps MxMo alive, many thanks to him who also keeps our imagination running. This theme month is Flip Flop! You can check the round-up here. We just love little spins on classics, you can see that in some old posts and some even fit the theme. but we’re going for something “new” that I’m serving this winter at Elvis King Pub, my tending place. Shake & strain into ice-filled collins glass. Garnish with spices. 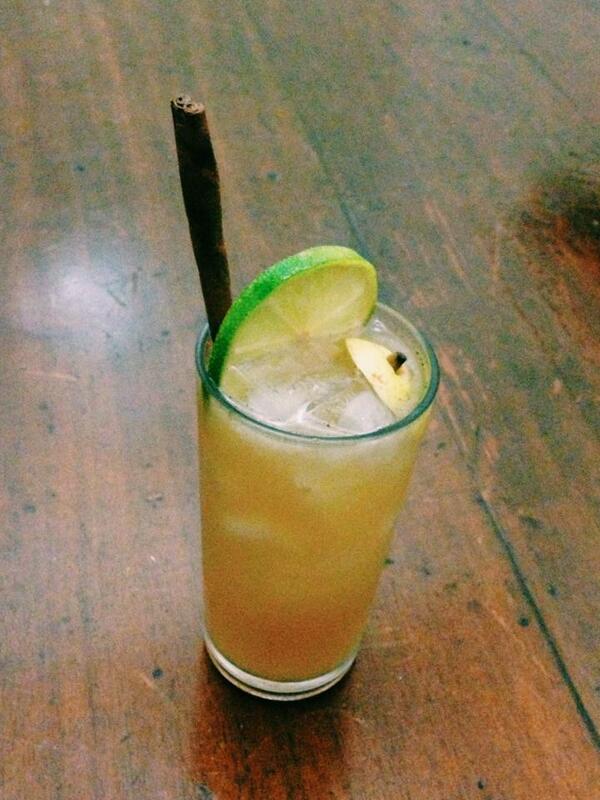 We use big cinnamon sticks, lime wheel and ginger slice. An Angostura float wouldn’t hurt! Shake & strain into chilled cocktail glass.Garnish with apple slice. We’ve enlonged the cocktail, but you can’t go wrong if you go with the same proportions as above. The Burning Love has a spice-citrus smell with a rounded pear-spiced sip and a peppery aftertaste with lots of cumin too. A good pairing to our Tex-Mex foods! We bought strawberries and mixed them! Muddle, shake, strain & sip! I’ve never had a “true” Mai Tai! Having never mixed good JAMAICAN rum, CURAÇAO orange liqueur, ORGEAT with lime and sugar, I can tell that the Mai Tai is a classic because you don’t need these ingredients to come with a really good cocktail! So, what are the main ingredients to a good Mai Tai? Shake and strain into an iced old-fashioned glass. Garnish aromatically. It is basically a fancy Daiquiri, but better! The daiquiri is a God’s worth cocktail! Everything based on it should show how the Daiquiri is the King! Embury have told us that almond flavors marry well with rum, we also know that orange liqueurs are good in daiquiris, adding a more refreshing and citrus-y snap! Good bold aged rum should be used here and the ingredients should showcase this! Full of thick and bold liqueurs like those you can’t get a lot of aroma, garnish aromatically, bringing all the goodness to the palate then. Mint, lime shell, pineapple and even a dark float rum will be good! Shake and strain into ice filled glass. Lime shell and rosemary sprig for garnish. 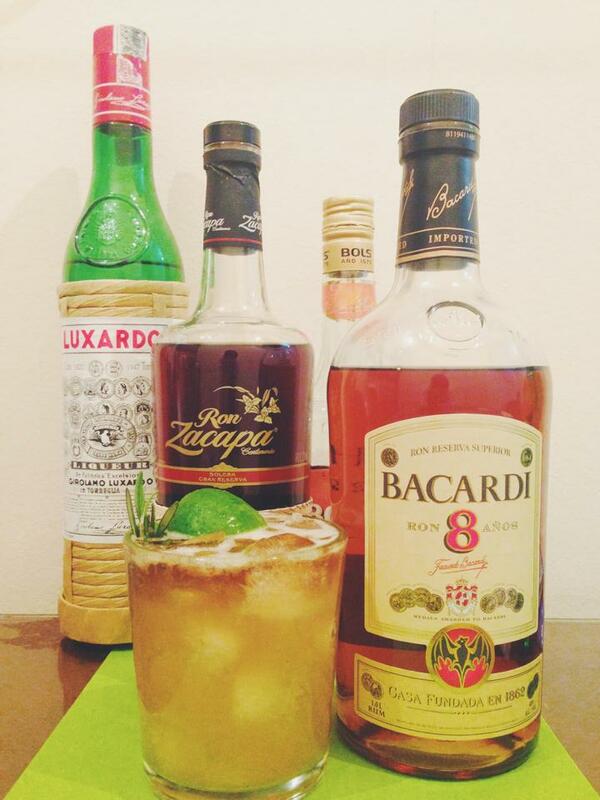 Float Zacapa. This was amazing, nutty, citrus, bold and fresh. It even remembered an exotic fruit, the texture, aroma and flavor really remembered me of brazilian paw paw! Understanding what is in a cocktail is really what takes to make better drinks. 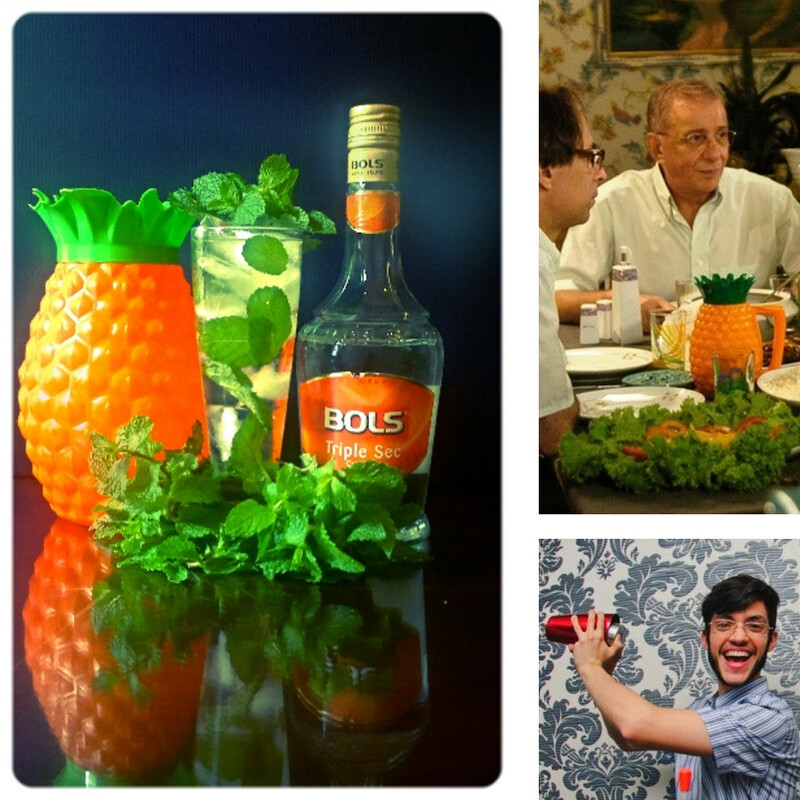 My cocktail for Bols Around the World 2013 is the one pictured above! It’s called the KAOD. BATW this year is themed on “inspiration”, I was already thinking about doing some cocktails for the touristic points in my city, inspired by the Bollywood Cocktail of Kathy Casey. If you want to make some bitters go there, if you want fresh fruits, beer, tobacco, fish, you got it, right? There’s typical dishes there, like fried liver with gilo or the KAOL (cachaça, arroz(rice), ovo(eggs) and linguiça sausage). So cachaça and pineapple (here know as abacaxi) would be my K.A. Since we love cheese I remembered the foodpairing: Pineapple, Bleu Cheese and White Wine. Shake and strain into a chilled cocktail glass. Garnish with a skewered bleu cheese. The recipe ended up with a long list of ingredients, but the simple syrup and the triple sec ware crucial to draw more pineapple flavor and also to add mouth feel. Since I finded that more on the sweet side, I added some lime juice. Then it was delicious. The Amburana cachaça compliments very well the aroma from the sip, at first you smell cheese and cachaça with some freshness of the pineapple. The sip goes with a dominant cheese aroma and some fruitness both from the wood and the fruit, when the glass go back you experience a very refreshing and tropical cocktail, with a clean finish on the palate. I’ve been really busy this last week, but I still have time to read, so all I need is time to write, otherwise I’ll forget all I have learned. I just pureed some strawberries and made some juice and, of course, a cocktail. Shake and strain into an ice filled highball glass. 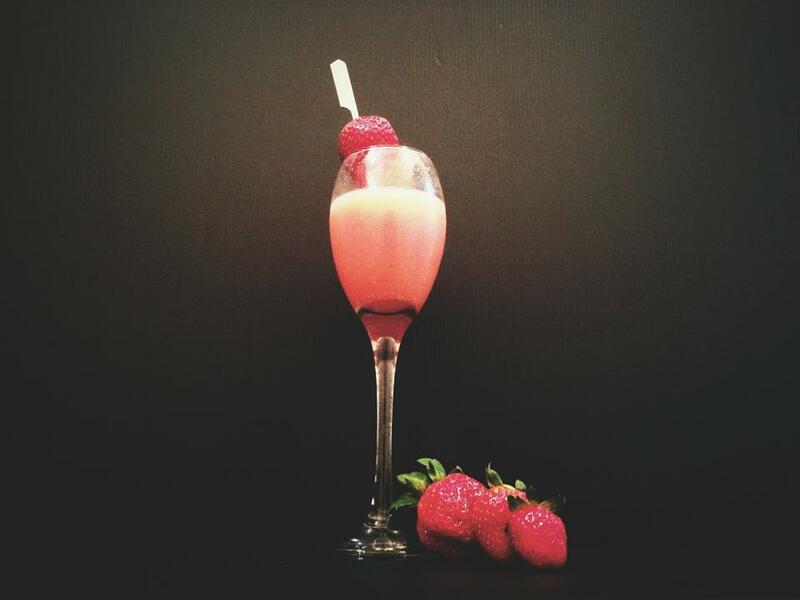 Garnish with a halved strawberry. This was delicious, juicy and well balanced. The bitters were last time inclusion, since the drink was good, but missing something. Aperol is a nice sweetner and, since I hadn’t limes, a nice bitter component to compliment the sweetness of the drink. Maybe I need some Acid phosphate in my house. You can read more about balancing juices in cocktails here. Cheers to my baby, which was approved this week in the college entrance! Gotta drink to that! Last weekend I was invited to work at a party, there would be only Japanese food and a lot of spirits for me to play with. There was a 3L bottle of sake and a bottle of Rose syrup. So I decided to buy some apple flavored soy milk. Soy milk and sake are some kind of “same culture pairing”. 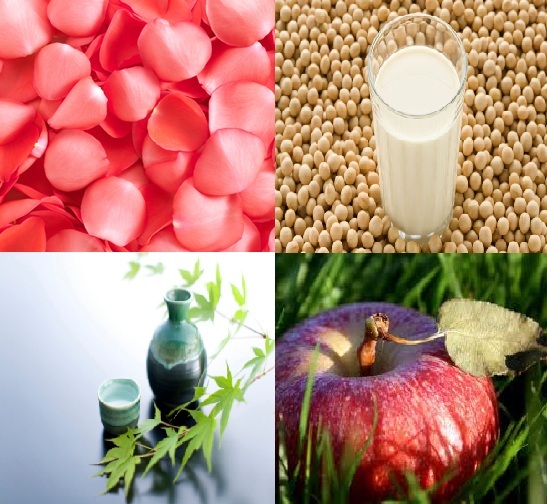 Apple and roses are from the “same odor pairing“. Shake and strain into a cocktail glass, garnish with an caramelized apple slice and some rose petals. It was tasty and everybody loved it. It is very light and is a nice piece that can benefit from improvements. Since we don’t have applejack here in Brazil, I’ll wait for someone to try this one out. That’s my first attempt to make a non-obvious pairing in cocktail.